While I was at Home Depot a few weeks ago purchasing wood for my dining room floating shelves, I also picked up some extra to replace my desktop. This metal desk was from my childhood bedroom, had a metal frame and glass top. I wanted to update it and give it an industrial look so I decided to replace the glass with wood and spray painted the bottom. Easy peasy. I purchased (2) 1x6x8 and had them cut in half at the store to fit more easily in my car. Once I was home, I used my table saw to cut them down to 40inches. I sanded the ends using my palm sander. Then, I laid the wood down on the floor side by side forming my desk top. Rather than get technical and figure out a way to secure the top to the desk legs, I simply added 1x2s to fit snugly between the metal to keep the top in place. This also attached the wood slats together easily. I used 1.5 inch wood screws to attach the 1x2s to the 1x6s, careful not to drill through the desk top. I stained the wood using Minwax Classic Grey that I had on hand. I applied the stain using a cloth and also used a bit of Annie Sloan's dark wax to finish it. In retrospect, I should have stained the boards beforehand as it was a little tricky to get in between them and ensure any unfinished wood wasn't peaking through. I spray painted the bottom of the desk using Rustoleum Oil Rubbed Bronze. Once it was dry, I placed the wood on top of the desk legs and it fit snugly and was held securely in place by the 1x2s underneath. I have been working on a few new projects lately including making over my laundry room and stenciling my bathroom floor. Can't wait to share updates with you soon !! I have been on a bit of a kick with wood projects lately. Wood is so inexpensive and an easy way to create new décor or add to existing furniture for a new look. After completing my DIY floating shelves and creating the wood top for my industrial style desk (details coming soon), I had lots of leftover pieces kicking around. I used a piece of 1x4 to create a simple hanging shelf for the spare bedroom. I took my 1x4 and used my largest size drill bit to drill 4 holes in each of the corners. I sanded the holes and then stained the wood using Minwax Provincial. 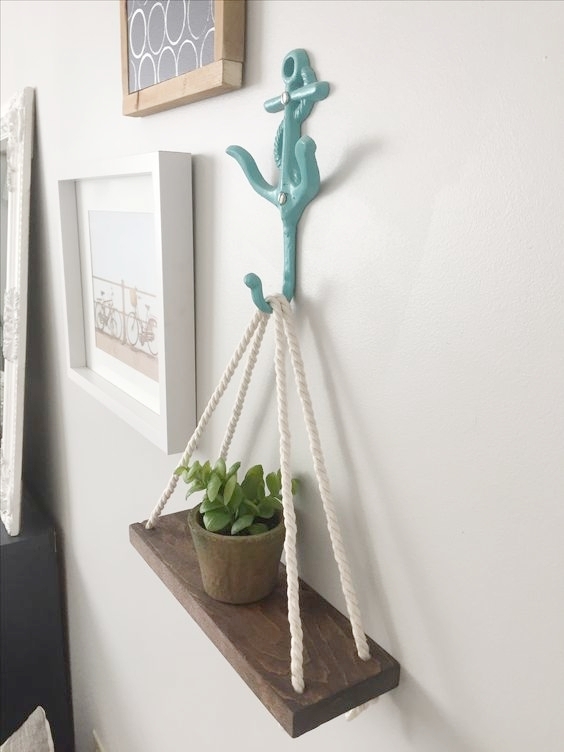 I had rope on hand that I had bought from the dollar store that I used for my DIY farmhouse sign. Once the stain was dry, I cut two pieces of rope at the same length. I took the first piece of rope and threaded the ends though the holes on the back of the board and tied knots to keep it secured. Then I repeated this with the second piece of rope through the front two holes. I ensured the rope was even and decided to hang it from my anchor hook in my spare bedroom. I am still trying to complete projects only using materials I have on hand. I did cave slightly and purchased some wood but it is so inexpensive that I don't feel too bad about it. I have been wanting to add some natural wood accents to a few spaces around the house. First on my list was to create some floating shelves for the dining room. I made two for our downstairs bathroom which I absolutely love so I used the same plans provided by Thrifty & Chic Decor, this time using their exact measurements (I made my bathroom shelves 24in rather than 36). You can find the full tutorial here. I purchased my wood at Home Depot and cut it at home using my table saw. I assembled the shelves as per the instructions and stained using Minwax Dark Walnut that I had on hand. I finished them using my Annie Sloan dark wax. I hung them ensuring to drill into the studs as I wanted them to be able to support some weight. I styled the shelves primarily using items I had around the house. I did purchase the Brown Booze recipe book from Homesense as well as the water jug from the dollar store. This tea cup was my grandmother's so it is very fitting that it is now on display. My favourite piece displayed on my new shelves is the framed cow picture. I already had the large black frame and found this free minimal cow printable from Okie Home. I always have San Pellegrino bottles on hand that I love to use for styling and decor. I also used the small wood wine sign to cover/distract from our thermostat. I made the decorative orb using embroidery hoops I had on purchased on sale awhile ago. I intend on spray painting them gold but haven't gotten to it yet. Stay tuned for more DIY wood projects.